As an activist investor, the CEO once took shots at struggling companies. Now he's experiencing life on the other side. Steven Becker used to be a pirate. A pirate of the financial world, that is. He ran his own hedge fund. He was an activist investor, firing broadsides at underperforming firms, jumping aboard their boards of directors, and shaking up their strategies. He spent his days mapping out strategies that involved alphas and betas and option-adjusted spreads and asset mixes and hurdle rates and risk arbitrage and all the other ins and outs required of activists of his ilk. But since late 2015, Becker has been focused on different kinds of ins and outs. Literal kinds, like the ins and outs of customers at Horn Pond Plaza in Woburn, Mass., and Pacific Plaza in San Diego, Calif. In both those places—and some 750 others like them across the country—you’ll find a store operated by Tuesday Morning Corp., a 42-year-old, Dallas-based discount home goods retailer with 2,000 employees. Becker has found himself, quite unexpectedly, serving as CEO there since December 2015. There are no pirates in Horn Pond Plaza, but there is a Tuesday Morning store just down from the Prana Power Yoga studio and Papa Gino’s Pizzeria. And in Pacific Plaza, there presumably are no captains of finance, but there is a Tuesday Morning that’s adjacent to Tweety Thai Cuisine and just around the corner from the Pretty Kitty Waxing Salon. Is that good real estate? Can shoppers find the stores easily? Do those stores need to be revamped, as the company, which is in the midst of a turnaround effort, is doing to 20 stores a year? Or should they be relocated, as Tuesday Morning is doing to 50 stores a year? Or maybe just restocked with, say, more Peacock Alley flannel sheet sets that are being sold for just $29.99? Are those stores, and all the other Tuesday Morning stores, living up to the promise the company makes to all of its shoppers? That’s the kind of thing Steven Becker now spends his days worrying about, safeguarding treasure. Which, when you think about it, is quite a thing for a former pirate to do. On June 5, 2012, Dallas-based Becker Drapkin Management, a hedge fund that Steve Becker had been operating with Matt Drapkin for a little more than two years, filed a form 13D with the Securities and Exchange Commission, showing it owned 5.7 percent of Tuesday Morning’s shares, a stake worth about $10 million. A 13D filing often serves as the opening volley in a battle pitting pirates—er, activist investors—against companies in which they’ve invested. But Tuesday Morning didn’t put up much of a fight. Instead, the company granted Becker Drapkin’s request for two board seats. (One went to Becker, the other to Richard Willis, the CEO of a company Becker Drapkin had also invested in.) And Tuesday Morning also fired its longtime CEO, Kathleen Mason, at the hedge fund’s request. Within months, longtime board members David Green and Scarlett Johnson left, as did chairman Bruce Quinnell. Terry Burman, past CEO of Sterling Jewelers Inc., and Michael Rouleau, the former CEO of Dallas-based Michaels Stores and the founder of Office Warehouse, had joined, with Becker becoming chairman and leading the board’s CEO search committee. Also within months a new CEO, Brady Churches, formerly of Big Lots, had been hired. Six months later, though, Churches was out—the company said he wasn’t the right cultural fit—and Rouleau, much to his surprise, was in. Rouleau once knew 50-year-old Steven Becker, who usually goes by Steve, by another name: “Stevie.” That’s what Rouleau, and everyone else, called Becker when he was a teenager growing up near Boston. Back then, Rouleau was an executive with Lechmere, an electronics retailer, and Becker was friends with Rouleau’s son, Andrew. By 2014, after shedding some product lines and bolstering the supply chain, a new Tuesday Morning was dawning. The company’s improved operations helped it start riding a big wave that had carried deep discount sellers like HomeGoods to record performance in recent years. 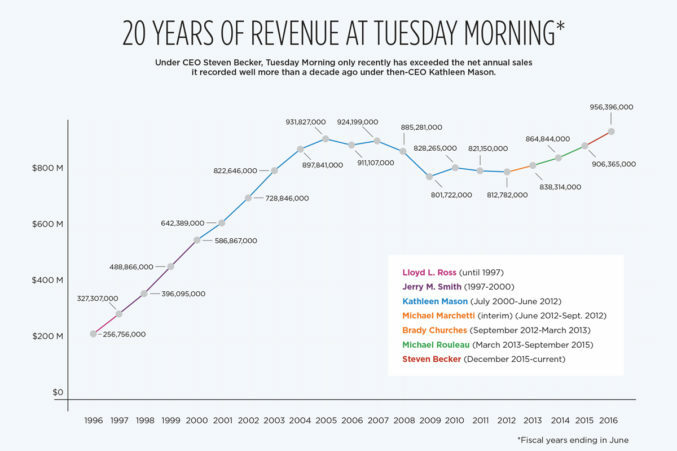 At Tuesday Morning, annual revenue was up to $865 million—a $50 million increase over 2012. The stock was up, too, rising from about $5 a share in 2012 to more than $21 a share. That’s when Becker Drapkin hoisted its pirate flag and started selling some of its shares, reportedly pocketing $13 million in profit. Early in 2015, Rouleau announced that a “rebuilding” phase aimed at long-term growth had begun, implying that the 18-month “turnaround” phase was over. The company’s stock promptly lost about 19 percent of its value the day after the announcement. And it kept sliding for most of the year, falling to $5.41 a share on Sept. 29—the day that the then-77-year-old Rouleau’s retirement was announced. Rouleau’s retirement came months ahead of when the company had expected him to leave, but his departure was accelerated after the company’s CFO, Jeffrey Boyer, another former Michaels executive, was recruited away to be CFO of Pier 1 Imports. Becker says the board decided it would be easier to recruit a new CFO once a new CEO had been announced, which hastened Rouleau’s planned exit. To fill the void left by Rouleau’s return toArizona, the company appointed an Office of the Executive Chairman to handle the CEO duties until a new chief executive could be found. The Office was a four-person oligarchy that included Becker; Phil Hixon (the company’s chief of stores, who once worked with Rouleau at Michaels); Burman, the former Sterling Jewelers CEO; and Melissa Phillips, a Home Depot executive who had joined the company as chief operating officer the year before. Becker, at that time, had also stepped off the Becker Drapkin pirate ship. He sold his interest in the fund, leaving Drapkin to restart it in Darien, Conn., under a new name, and leaving Becker to focus on being a top executive at a public company for the first time ever. Steven Becker, an experienced activist-investor-turned Tuesday Morning CEO, shares his advice about shaking up a company’s board of directors—and keeping the directors sharp. Becker is not the first activist investor to take a CEO role with a company in which he invested. Eddie Lampert, who runs ESL Investments, kicked off that trend in 2013 when he became CEO of Illinois-based Sears Holdings, a retailer that has struggled ever since a 2005 merger with Kmart that Lampert pushed as chairman of the Sears board. Last year, Lampert’s fund loaned the company $300 million to keep it afloat. Tuesday Morning’s debt is much more manageable, and has nothing to do with its activist investor-turned-CEO. The company has $32 million in debt against $950 million in annual revenue—a healthy ratio by most accounts. And although profits fell from $10.3 million in fiscal 2015 to $3.7 million in fiscal 2016, due to problems with a new distribution center in Phoenix, the company is still in the black for the moment. As those years go on, the company is looking to attract customers beyond its core demographic of women aged 50-74 who have household incomes of $100,000 per year. By building new stores and freshening up existing ones, Tuesday Morning hopes to draw younger customers to its daily deals as well. In fact, since Tuesday Morning abandoned its online commerce presence in 2013 under Rouleau, it is banking its entire future on new, improved stores. The company expects to continue closing 40 stores per year. It is relocating 50 stores per year from underperforming storefronts to brighter, cleaner locations nearby. It’s remodeling and expanding 20 locations each year. And it is opening 20 to 25 new stores in new locations annually. Taken together, this rebuilding will cost around $40 million a year. If that growth continues, one Tuesday Morning analyst—Jeff Van Sinderen, with B. Riley in Los Angeles—says he believes Tuesday Morning, “could attract the interest of a suitor.” And, guess who would stand to benefit greatly from a takeover by a larger competitor? A competitor, for instance, like the company’s primary competition, TJX, the $30 billion retailer that owns TJ Maxx, Marshalls, and HomeGoods stores? Steve Becker, the former pirate.